SSC Stenographer examination Notification is out now, so those who are looking for this examination they can apply now. 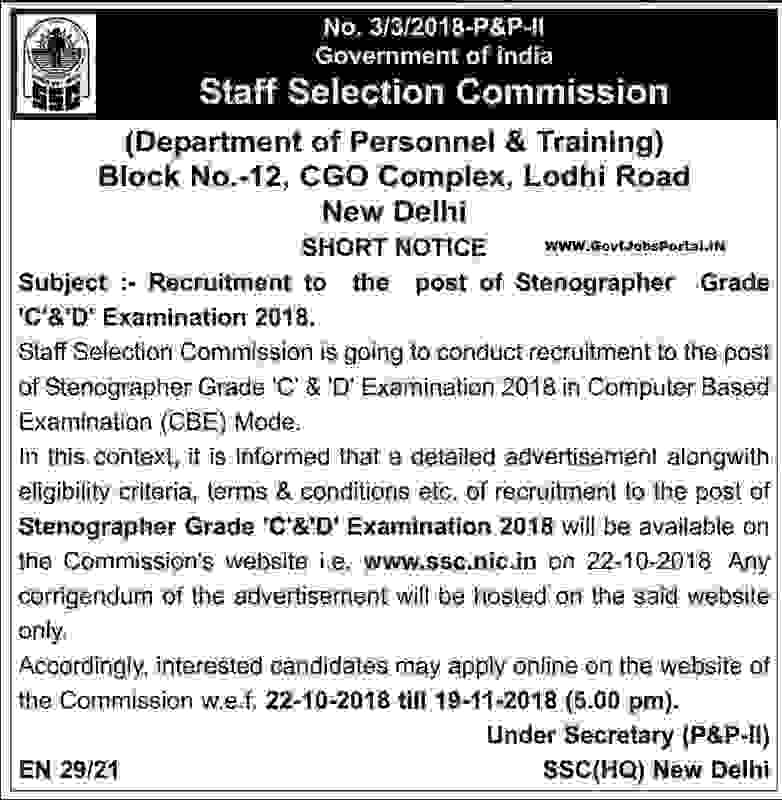 SSC Conducts this Stenographer examination every year to recruit candidates as Grade-c and Grade-D Stenographer posts all over India. This is a Centre Government recruitment process, so candidates will be recruit all over India in various offices. 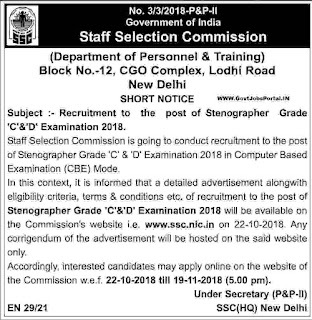 The Staff Selection Commission will hold an open competitive Computer Based Examination for recruitment of Stenographer Grade ‘C’ (Group ‘B’, Non-Gazetted) and Stenographer Grade ‘D’ (Group ‘C’) for various Ministries/ Departments/ Organizations in the Government of India. More information related to these Government jobs for Stenographer posts is given below in this article. Read it before applying online. Education: All Indian fresher candidates who have passed in their 12th class examination in any stream can apply for this SSC Recruitment process 2018. Applicants who are wishing to apply for this SSC Stenos recruitment process must have speed of 100 word per minute (w.p.m) for the post of Stenographer Grade ‘C’ and 80 w.p.m. for the post of Stenographer Grade ‘D’ posts. Age Bond: All applicants age must be in between 18 years to 27 years for applying Grade-D stenographer posts. While for applying Grade-C Stenographer posts must have the age in between 18 years to 30 years. Method For Payment: Those who are going to apply online through the SSC Registration form which are available on SSC Official website have to pay the above application fee structure. Candidates can use the following methods for the payment of the application fee: “Debit Card, Credit Card, Net Banking”.